Noémie Goudal's work brings real and theoretical geographies into coexistence, creating a space between physical reality and its mental representation. Goudal's photographs document staged interventions that induce scepticism and complicity in equal measure, announcing themselves as fictitious yet compelling a suspension of disbelief. Goudal's oeuvre explores our instinctive need to explicate our surroundings in a unifying theory, and her inquiry resides in the distance between observation and interpretation. Goudal's recent work reimagines moments of historical scientific discovery relating to our search for a sense of place: her last series, Stations, fixated on the sky as a space into which prevailing philosophical thought was projected until the Copernican Revolution. For Telluris, Goudal's third exhibition at Edel Assanti, the artist progresses her investigation from the sky to the earth itself. A site-specific architectural installation houses works from two new photographic series. The scenography consists of a wooden frame, inspired by the skeletal structures underpinning fake manmade landscapes; a mathematical construct of vertical and horizontal lines forming cubes of equal dimensions. 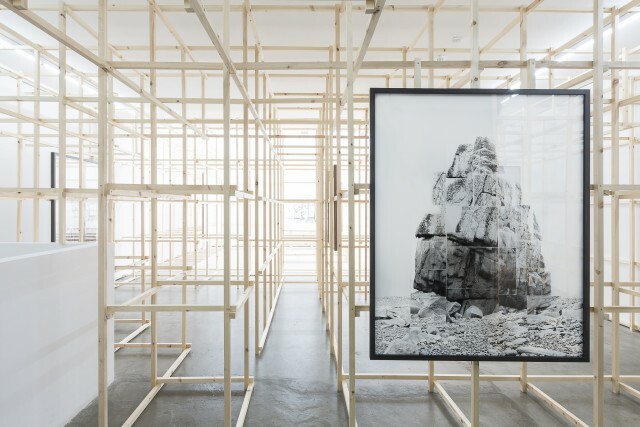 The installation's forms are echoed in black and white photographs that depict fake monumental mountainscapes in the desert, each comprised of twenty-five stacked wooden cubes. Drawing on historical theories dating back to ancient thinkers, this gesture reduces the landscape to the geometrical frameworks that were used to theorise how it came to exist. The crisp black and white images possess an intentionally timeless quality, harking back to the age of analogue scientific discovery. The landscape is represented as an embodiment of the effort to conceive of the natural world within a mathematical order - the square employed as an instrument of precise measurement. Several works from a parallel photographic series are also housed within the installation. These images show fragmented views of large, jagged rock formations. Closer inspection reveals that these too are products of deliberate staging: an installation of mirrors positioned at different distances from the object itself has transformed a turbulent landscape into a series of reflections, presenting as a comprehensive geometrical formation. The series evokes the reality of the landscape as an entity in constant flux, beyond the limitations of our senses. The lower ground floor gallery houses a sculptural work that develops Goudal's previous investigations into the stereoscope as an early means of presenting photography. A vertical isosceles triangle stands in the centre of the gallery, covered in mirrored panels. Two slide projectors throw what appear to be a series of identical images on to two screens either side of the mirrored triangle. When standing directly in front of the pillar, the two screens are independently reflected into the viewer's eyes by the two sides of the mirror, allowing the viewer to see a stereoscopic, seemingly three-dimensional image. However, whilst stereoscopic cameras mimic the dual perception of the eyes through capturing two separate images, Goudal's slides are in fact digital emulations of this effect: on facing the mirror, the viewer realises that each slide presents completely different features of the landscape as protruding. The stereoscope thus reverses the dynamic of Goudal's other photographs: whereas the staged images transform elaborate fictions into plausible reality through a material trompe l'oeil, her stereoscopes turn reality, or its representation, into a false construct through optical manipulation. Noémie Goudal's recent solo institutional exhibitions include Cinquième Corps at Abbaye de Jumièges (Normandy, France), 2017, and Le Bal (Paris, France), 2016; Southern Light Stations at The Photographer's Gallery (London, UK), 2016; The Geometrical Determination of the Sunrise at FOAM Museum (Amsterdam, Holland), 2015, and New Art Gallery Walsall (UK), 2014. Forthcoming institutional solo exhibitions include Finnish Museum of Photography (Helsinki, Finland), 2018; Fotografiska Museet (Stockholm, Sweden), 2018; Musée des Beaux-Arts Le Locle (Switzerland), 2019. Goudal's work is held in international public collections including FOAM Museum, Fotomuseum Winterthur, Kiran Nadar Museum of Art and Musée de la Roche-Sur-Yon. Goudal has received numerous awards including the 'Royal College of Art Sustain Award' (2010) and the HSBC Photography Prize in 2013. Goudal currently lives and works in Paris, France.